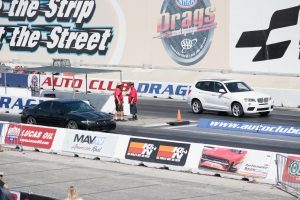 Race enthusiasts came together at the Auto Club Dragway in Fontana in an effort to reduce illegal street racing in the local community. The event is focused on providing a safe experience for those who want to race their car without risking an accident or breaking the law. Racers are provided with a fully staffed crew, technical inspection team, a well-maintained drag strip and a paramedic team for $20 a day. Spectators are charged a $10 entry for the day. The event is well-known in the local car community. It frequently receives an impressive turnout of about 175 cars or more. Although many die-hard racers attend the event, it’s not strictly for experienced racers. Check-in begins at 8 a.m. and racing goes from 9 a.m. until about 4:30 p.m. Upon arrival, participants buy their entrance ticket and continue down to technical inspection. The inspection team examines your vehicle from top to bottom, looking for things that can disqualify you like leaks, bald tires and other safety concerns. The primary goal of the technical inspection team is to ensure that you are not a safety hazard to yourself and other participants. Once certified, racers set up their temporary pits and prep their cars. This typically consists of swapping the rear tires for drag slicks and prepping their engines. Drag slicks are a different style of tire that allows maximum traction when accelerating and helps to achieve a faster start. Next, participants enter the race line. Earlier in the morning, the average wait time is around 10 to 20 minutes to race. As more racers arrive, the wait time increases. Each car is allowed to do a burnout in what is called the burnout box to warm up your tires for better traction. Most all-wheel drive and front wheel drive cars opt to go around the burnout box. Each car is staged until two yellow lights on the light tree are lit. The light tree then flashes yellow twice and then turns green; that’s when the cars launch. After a quarter mile down the strip, racers come to a stop and collect tickets with statistics stating the seconds it took to go a quarter mile and how fast you were going in miles per hour (mph). Jack Obannon was the fastest racer of the day, going the quarter mile in 9.686 seconds at 138 mph in his 1962 Chevy Nova. Obannon is a very experienced drag racer. 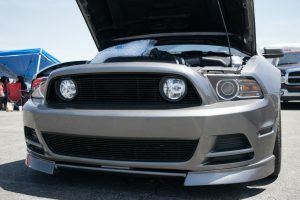 Jose Carillo, being much younger than Obannon, has been attending the Street Legal Drags event for almost a year now with his 2013 Mustang with 590 horsepower. He came out to enjoy a day of racing with his friends. Carillo keeping his air intake cool with ice between races.